Hibben in other words decided to obscure in part the identities of Princeton’s war dead via the content of the Memorial Atrium. By doing so, he also obscured the Union and Confederate causes for which many Princetonians fought and died—or at least conflated these causes morally. “This is an interesting material example of Princeton’s complicated relationship with its own past, particularly with the Civil War and with slavery,” our guide told us. As a parallel to the Princeton & Slavery Project’s coverage of the Memorial Atrium, Art & Archaeology Professor Nathan Arrington’s work on Athenian casualty lists comes to mind. Casualty lists were slabs of marble (stelai) created annually throughout the fifth century to be first honored at the public cemetery, then displayed in highly visible settings, most notably alongside Athenian roads. Arrington’s work argues that, despite being commemorative monuments, these lists often actively omitted information about Athens, its conflicts and who fought in them. Most stelai listed Athenian citizens, non-citizens and slaves alike under a general heading without differentiating them socially, except sometimes by the democratic ordering principle of the ten Attic tribes, some of which included non-citizens and slaves ambiguously. Also left out was each man’s patronymic (family name). Since common first names could repeat multiple times, widows could not always identify their loved ones. Casualty lists therefore anonymized casualties along class lines as well as with respect to familial relationships. This anonymity, Arrington suggests, can be understood as part of a strategy of forgetfulness toward past events in Athens (particularly defeats and death in war) which, paradoxically, is essential to constructing memory narratives about these events. Since the Memorial Atrium in Nassau Hall appears to employ a similar strategy of forgetfulness, comparing it against the Athenian casualty lists shows us that we not be as modern as we think in our commemorative responses to tragedy, even now. Both monuments curate a singular memory of their civic body’s conflicts in a collectivizing yet revisionist manner. Arrington’s 2011 article “Inscribing Defeat: The Commemorative Dynamics of the Athenian Casualty Lists” investigates how, in Athens, this curatorial process of revision served vital political functions: casualty lists “alternately [marked] and [elided] defeat to create a visual rhetoric of collective resilience and continuous struggle” as part of “an aggressive, unifying narrative about Athens and the Athenians.” Regardless of Athens’ track record that particular year, each casualty list would have been understood as part of a solemn, intergenerational tradition that privileged longevity in war and the collective identity of the polis over absolute victory and the identity of individuals. “[A]s the personal identity of the dead faded,” Arrington writes, “the specificity of the event marked by the stone sharpened” within a greater arch of Athenian history and ongoing sequence of sacrifice. The Princeton administration was therefore tasked with helping the University remember the Civil War in a way that could also restore the institutional unity lost both leading up to and during the conflict. One option, as the Princeton & Slavery Project reminds us today, was to monumentally equate Union and Confederate objectives, eliding differences between emancipation and slavery in the process. Although a similar phenomenon occurred in classical Greece, key differences emerge as far as forgetting individual identity is concerned when the Memorial Atrium and Athenian casualty lists are compared in their respective civic contexts. 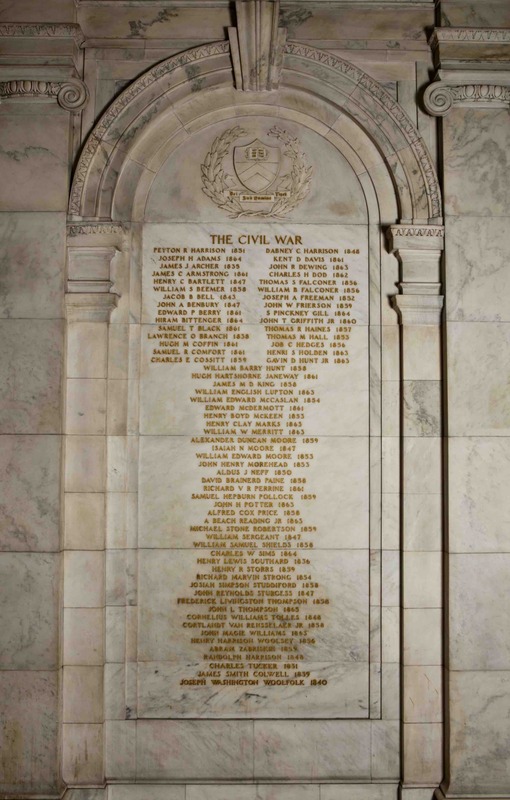 For one, casualty lists seem to have erased the socioeconomic divisions that might have prevented Athenian unity while fighting future wars, whereas Princeton’s Memorial Atrium omitted those divisions which we now understand to have caused war in the first place. While it remains unclear which monument to a greater degree attempted to erase history, both have revealed a lot by doing so.